The Flash -- "Back to Normal" -- Image: FLA219b_0131b.jpg -- Pictured: Grant Gustin as The Flash -- Photo: Katie Yu/The CW -- ÃÂ© 2016 The CW Network, LLC. All rights reserved. It’s a normal day in Central City, especially for Barry Allen since he’s no longer The Flash. I guess he’s still technically The Flash, he just doesn’t have his speed anymore. Cisco vibes on Jay’s helmet and briefly sees Caitlin in his lair, unharmed. Dr. Wells however is gearing up to leave, he’s found Jesse, and since Barry is powerless there’s not much going on here. Meanwhile on Earth-2, Caitlin is chained to a bed and Zoom promises not to hurt her, because… he loves her! Surprise! As a show of good faith, he unchains her before leaving. Caitlin walks around and sees the man in the mask in his little box, and across from him… her doppelganger, Killer Frost. 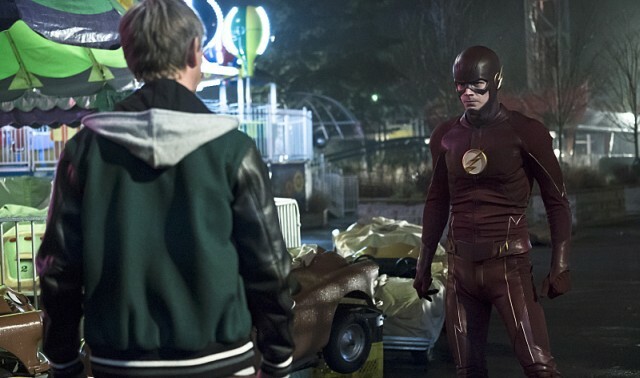 Back on Earth-1, Wally comes to CCPD to ask Joe about The Flash. When Zoom took him he said someone The Flash cares about cares about him, and it’s obvious that’s Joe. He asks if he can arrange a meeting with The Flash, but Joe refuses outright. Somewhere else Wells knocks on an apartment door to find Jesse, and there she is. He tells her they need to go but she won’t go, she’s already started a life on this new Earth and she can’t forget that he killed someone to save her. She looks at him the same way she does Zoom now. Dejected, Wells drives back to STAR Labs, but in the midst of his trip, a guy steps into the middle of the road in front of his van. Wells crashes into him, but the man suffers no damage. He rips the door off and takes the groggy Wells with him. In the main hub, Barry watches reports about crime increases in the city and knows people will realize he’s not around anymore. No time to worry though, an alarm goes off and Cisco sees Wells being kidnapped. Barry heads to the scene of the crime with Iris to do his thing. Back on Earth-2, the Caitlins talk about a number of things – who the man in the mask is (she doesn’t know, why Zoom was keeping her hostage (she also doesn’t know), and that Killer Frost will help Caitlin escape if she gets her out of her case. At the crash scene, Barry lifts finger prints from the door and through the powers of deduction realizes that the dent in the van is person-shaped. Perhaps it’s a metahuman after Wells from Earth-2, if only you knew. Wells wakes up in a carnival warehouse to his metahuman tracker watch beeping. Upon opening his eyes he meets Griffen Grey, who cops to being a metahuman quite quick. His power? Super strength, he twists a giant metal disc like it’s a pretzel. There’ a problem though, he’s 18 but he looks like a fully grown adult. He’s rapidly aging. He wants Wells to help him, but he says he can’t, which means he’ll end up killing him as teenage super villains are want to do. Back at STAR, Jesse feels guilty for not going with her father, and Cisco reveals he’s figured out who the abductor is and they figure out he’s not an 18-year old, but a middle-aged man in Pac-Sun clothes. Barry gets to do real police work to find him since he’s powerless. On Earth-2, Caitlin works to free Killer Frost who talks a bit about her origin, which is literally waking up one day and having powers now. They also bond over their mother’s power attitudes, with Killer Frost revealing the death of her brother sent her mom in a spiral. Back on Earth-1, Wally goes to see Joe again to ask about The Flash, but he explains himself this time. He wants to thank him for giving up his powers to save him, no one has ever done anything like that for him before. To be fair, few people have probably had superheroes give up their powers to save them even in Central City. Wally just wants to tell him how much that means to him, and Joe concedes that this is a good reason to meet The Flash. The team gets an alert that Grey is breaking into Ace Chemicals (the Gotham City branch being the place where Batman would cause The Red Hood to become The Joker). Joe, Barry and Cisco all enter the building with weapons to take down Grey, who goes full Donkey Kong and begins chucking giant barrels at them. Barry flanks around, but he misses his shot and takes a barrel to the chest. When he looks up though, he sees Griffen aging in front of him. At the lab, Jesse reveals from the blood sample that they somehow have that Griffen’s cells are using up protein at an accelerated rate, so the more he exerts himself the faster he ages. The team decides they should make him exert himself to the point of being an old man instead of helping him. They all break to work on their parts of the plan, leaving Barry and Iris to talk. He tells her that she was the first person he saved after he got his powers, but now that he doesn’t have them he doesn’t know who he is anymore. Iris reminds him he’s the same person he’s always been. At the carnival warehouse, Wells works on a compound to fix Griffin who tells him about the life he had before the particle accelerator and the girl he was going to marry, who doesn’t even recognize him anymore. He tells Wells he hopes his experiments were worth it. 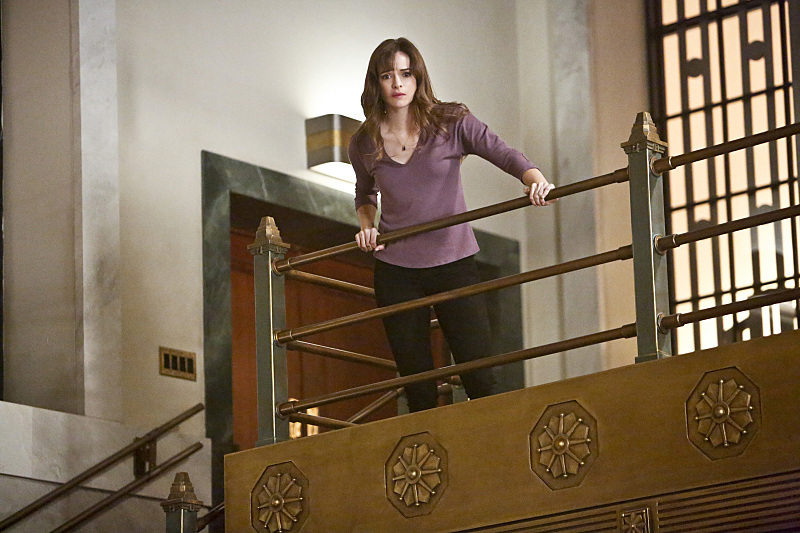 Caitlin prepares to weaken Killer Frost’s cage on Earth-2, and sets her doppelganger free after it works. The man in the mask knocks on the glass, but before Caitlin can consider helping him, Killer Frost sends her flying across the room. See, she’s figured out why Zoom kept her, it was his way of always having Caitlin around. Since Caitlin is on Earth-2 now, he has no use for her. Killer Frost throws an ice dagger at Caitlin, but Zoom runs in and phases through Caitlin to catch it. He quickly turns it over and stabs Killer Frost with her own ice knife, killing her. Hunter then unmasks and tells her if she thinks about doing that with the other prisoner, he’ll kill him too. 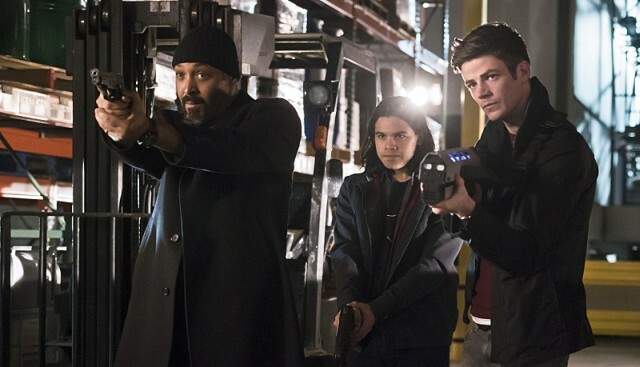 As the team prepares to go after Griffin, Cisco reveals an upgrade to The Flash suit: some of the Dwarfstar alloy, like in the ATOM suit, that will allow him to absorb one good punch from Griffin. In the warehouse, Wells hands over the chemical and Griffin declares himself a master of chemistry, and knows Wells has just been messing around with no hopes of actually fixing him. 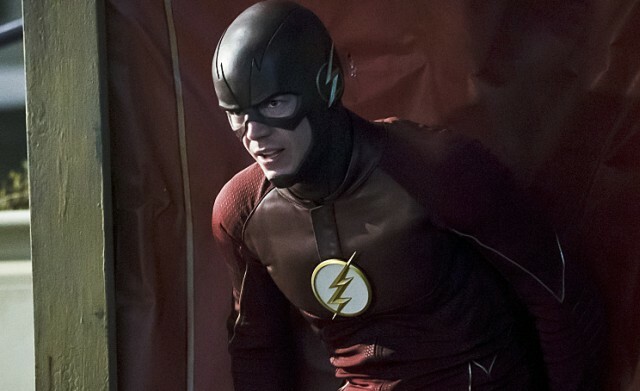 Before he can deliver the killing blow, he sees The Flash and his team have arrived. They lure Griffin into a trap and force him to swing at Barry, causing him to age even more. He does finally get a hit on Barry though, and sends him flying while also sprouting gray hair. Barry draws him out and takes another hit, one over the limit, and both of them fall to the ground. He’s okay though and when he goes to check on Griffin, he’s reverted back to his 18-year-old self in his death. Hope it was worth it indeed. The team goes inside and finds Wells. Naturally Jesse gets there first and sets him free. Wells and Jesse go back to their room at STAR Labs where she apologizes for leaving, but knowing that she was the reason her father killed someone is a high burden to carry. He confesses that when he mother died it made him snap, which shouldn’t be comforting, but they hug anyway. Across town, Joe arranges for Wally to meet The Flash and he finally gets to tell him thank you, and that he won’t waste the chance he’s been given. On Earth-2, Zoom knows Caitlin wants to go home so he taunts her. The way he used to measure his success was with the number of victims he had, but he thinks maybe he should tally it by the Earths he’s conquered. Since Earth-2 is already on its knees, they might as well go back to Earth-1. Back at STAR, Barry stares at his suit and Wells enters. Barry laments that they can’t save Caitlin without his powers, and Wells agrees. The good news is that he’s had some time to think and he thinks he hasn’t fully paid for the damage he caused on Earth-2. As a result, he’s going to help Barry get his speed back… by creating another particle accelerator explosion. You can watch a preview for the next episode, titled “Rupture,” using the player below. Underneath, you’ll find photos from the episode as well.